Stories are abound about Azim Hasham Premji in the Indian business circles. Here, we capture his advice to techies in ten simple commandments- Premji's commandments. We must learn to look at change as an exciting adventure rather than a disruption. New avenues for learning always lie just beyond the shade of our comfort zone. Stories are abound about Azim Hasham Premji in the Indian business circles. He is credited with transforming the fledgling $2 million hydrogenated cooking fat company he inherited from his father at the age of 21 into a $2.1 billion IT Services organization serving customers from across the globe. A recipient of many awards and accolades-primary among them being Time magazine's listing him as one of the world's 100 most influential people in 2004 and the Padma Bhushan in 2005-Premji, unlike many others believes each one of them is recognition for all those who over the years have shared his thoughts and experiences on a host of issues ranging from India's meteoric rise in the world order to the importance of universal quality education. Here, we capture his advice to techies in ten simple commandments-Premji's commandments. The first thought that crossed young Azim Premji's mind when he stepped into the Wipro factory at Almaner was 'take charge'. The times decidedly were tough. His father had passed away and he was faced with the dilemma of coming down from Stanford University leaving his electrical engineering degree mid-way, to look after the family's vegetable oils business or as many people advised, taking up a nice, cushy job. "At such times when you feel lost," he says looking back, "there is a small voice inside you that tells you where to go. You can either amplify the voice to make it the purpose of your life or ignore it and turn if off." An essential component of taking charge is having a dream as to where we want to go. No doubt there will be setbacks in the pursuance of that dream, but still we must keep dreaming. Says Premji, "What saddens me most is to see young, bright people getting completely disillusioned by a few initial setbacks and slowly turning cynical. What's worse is that some of them want to migrate to America hoping that it is the solution." Dreams are most needed when just about everything is going wrong. They provide the inspiration and ensure that one remains in charge of the situation. "It is a common saying that a Rupee earned is of far more value than five found," says Premji. He recalls innumerable interviews when he's asked the interviewees to narrate their most memorable achievements and they've recounted those which needed maximum effort on their part. "It is almost as if the pain they faced is now an integral part of their pleasure," he says, adding, "I guess we only know the value of what we have if we have struggled to earn it." "It is impossible to generate a few good ideas without a lot of bad ideas. Failure should be forgiven and forgotten quickly," says Premji. If we encounter failure along the way, we should treat it as a natural phenomenon and not beat ourselves or any one else for that matter. In fact, as the following story illustrates, we could look at failures or pitfalls as the stepping stones to success. One day a farmer's donkey fell into a well. It cried piteously for hours as the farmer tried to figure out what to do. Finally, he decided the animal was old and the well needed to be covered up anyway. So he, along with his neighbors, grabbed a shovel each and began to shovel dirt into the well. On realizing the motive behind the act, the donkey initially cried more loudly and then, to everyone's amazement, quietened down. A few shovel loads later, the farmer curiously looked down the well and came away astonished. With every shovel of dirt that fell on his back, the donkey would shake it off and take a step up. As the farmer's neighbors continued to shovel dirt on the animal, he would shake it off and take a step up. Pretty soon, it stepped over the edge of the well and tottered away. "Life is going to shovel dirt on you, all kinds of dirt," says Premji. "The trick is not to get bogged down by it. We can get out of the deepest wells by not stopping. Shake it off and take a step up!" Even while practicing the shake off and step up act, we ought not to let success get into our heads. In other words, retention of humility is a must. He narrates another story to elucidate its importance. A lady and her husband, both dressed in faded clothes, walked in without an appointment into the office of the President of the most prestigious educational institution in America. After waiting for hours, they were allowed to meet the President who glared sternly at them. The lady said, "Our son, who studied here was killed in an accident a year ago." She expressed her desire of erecting a building in memory of her deceased son in the University campus. "A building?" exclaimed the President, looking at their worn out clothes. Convinced that they did not have the means to erect a memorial, he said, "Do you have any idea that our buildings cost close to ten million dollars?'' With that, the President thought he'd get rid of them. The lady looked at her husband calmly. "If that is what it costs to start a university, why don't we start our own?" she queried. Her husband nodded. Mr. and Mrs. Leland Stanford walked away, traveling to Palo Alto, California, where they established a University as a memorial to their son, bearing their name - the Stanford University. As this story shows, the moment we allow success to build a feeling of arrogance, we become vulnerable to making bad judgments. Partly a corollary to his previous commandment, this one is centered around the fact that no matter how well we do something, there is always a better way to do it! "Excellence is not a destination but a journey," quips Premji, adding that sometimes when we reach a plateau in our climb for perfection, we need to look sideways. After all, innovation oftentimes is inspired from other disciplines. It is probably not a coincidence that Einstein's interest in music was as much as his interest in Physics and Bertrand Russell was as much a mathematician as a philosopher. While success and finding better ways to reach its pinnacle are important, it becomes enduring only if it is built on a strong foundation of values. 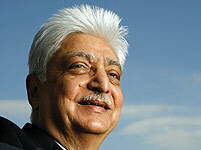 Premji, for one, is revered by his colleagues in the industry for insisting that Wipro will not pay bribes. He says that the fast propagation of the notion that values stand in the way of success holds no merit. According to him, values serve as a strong anchor in a turbulent sea of changes and provide faith at times when it seems we are surrounded by darkness. They provide the courage to stand up to any distractions along the way. "Combined with a powerful vision, values can turbo-charge us to scale new heights and make us succeed beyond our wildest expectations," he quips. Wipro's head honcho notes that too many people are so enamored by the legacy of success in their current roles that they are afraid to look further. This, he opines, often leads to inertia. "We must learn to look at change as an exciting adventure rather than a disruption. New avenues for learning always lie just beyond the shade of our comfort zone," he explains. Playing to win does not mean playing dirty or cutting corners to get to the goal. Instead, it has to do with bringing out the best in us; it involves the desire to stretch and achieve something that seems beyond our grasp. For this, we must learn the importance of playing as a team. "The challenges ahead are so complex that no individual will be able to face them alone," says Premji, a winner in his own right. While most of our education is focused on individual strength, teaming with members is equally important. "You cannot fire a missile from a canoe," he reasons, adding, "Unless you build a strong network of people with complimentary skills, you will be restricted by your own limitations and winning will remain a distant dream." The aspect of playing in a team has also undergone a sea change in the last decade or so. Globalization has brought in people of different origins, upbringings, and cultures together. Today, playing as a team needs to include the ability to become an integral part of a cross-cultural team. Exercising and remaining fit is something that most techies take for granted in their youth. But they ought not, especially because exercise not only improves the health but also aids in better sleep while reducing the time needed for sleep itself. This assumes significance given the 24/7 rotation-oriented shift patterns most techies are required to follow. "While stress will go on increasing in a global world, we must find our own mechanism to deal with it," says Premji, adding that there is enough literature to support the finding that exercise effectively reduces stress. It is essential that we understand the difference between responding and reacting. While we respond, we evaluate with a calm mind and do whatever is most appropriate. We are in control of our actions. But when we react, we end up doing what the other person wants us to do. In this context, Premji recalls, as a youth 'reacting' to orders he did not resort to rebelling. "Rebellion as a reaction is conformity to something else," he says thoughtfully. Oftentimes, when it comes to negative criticisms, he notes reflecting on his experiences, we make the mistake of reacting rather than responding. We must always welcome any form of criticism, for, as the story below illustrates, it helps us better ourselves. A boy enrolled in an art school dreamt of becoming a great artist. His aspiration however was pulverized by his teacher who would always find some fault with his work. The student improved on his work continuously, hoping that one day he would hear a word of appreciation from his teacher. But it never happened. Finally, in disgust, he bought a painting from an accomplished artist, touched it up with fresh paint and showed it to his teacher. The teacher smiled and said, "Now this is really good work. Congratulations." Feeling guilty, the student confessed that it was not his painting. The teacher looked at him for a while and said, "Till now, I thought you wanted to paint a great picture. But I realize now that you do not seek any further improvement; it means that the last painting you did was the best you will ever do. Remember you have set these limits to your talent, not me." "As we see here," says Premji, "criticism may actually be an expression of faith in us rather than a means of putting us down." If we react rather than respond to criticisms, we will only be limiting ourselves. The fact that the Wipro wizard has made a case for having a broader social vision many times over in numerous forums across the world explains how close it is to his heart. "For decades we have been waiting for someone who will help us in 'priming the pump' of the economy," he notes with a certain discomfiture. Many think that thinking and working towards social causes is the sole onus of the day's government, but that is not the case. He elucidates how, in the 'millennium of the mind', knowledge-based industries like information technology are in a unique position to earn wealth from outside. This wealth, or a part of it, they must invest in bridging the immense inequality between India's rich and poor. Not limiting himself to just philosophizing, Premji set up the Azim Premji Foundation. The foundation works towards the universalization of Primary Education. "The greatest gift one can give to others is the gift of education," he quips, reflecting emotionally on those who have educated him during his formative years, most of all, his father. "The greatest legacy he endowed me with was the legacy of values. That is what has helped me become what I am today," signs off the new-age Indian plutocrat who incidentally loves hiking and insists on flying economy class.